These shaggymane mushrooms are pretty easy to identify. In fact, they are often called 55 mph mushrooms. However, identifying other mushrooms is not so easy and mistaken identity can be a fatal mistake if you eat the wrong one. I just couldn’t seem to make it 50 yards down the trail without falling to my knees. I wasn’t exhausted, I was overwhelmed with photo opportunities that all happened to be at ground level. Mushrooms, in a terrific array of shapes, sizes and colors, were popping up everywhere. My companions thought me a bit daft as I groveled belly-flat on the ground trying to capture the personality of the wide varieties of fungi surrounding us. This seems to be an extraordinary fall for the production of fruiting bodies of fungi called mushrooms. Wet conditions often favor fungal growth and August rains that produced 10 times or more moisture than the normal average for the month may have had something to do with that. The many mushrooms that we were seeing are like the fruits of a tree. They are the above ground evidence of far more extensive organisms that live in a hidden world. The real body, or “tree”, of a fungus is called a mycelium and it is made from a web of tiny filaments called hyphae. Unlike the fruiting bodies, the mycelium may be hidden in the soil, a rotting log or even the body of an insect or other animal, including humans. A mushroom fairy ring, a round circle of mushrooms, offers a good way to visualize the hidden mycelium. The underground and unseen mycelium grows outward in a circle. The fruiting bodies pop up at the outer edge of the mycelium, creating a ring of mushrooms. Mushrooms are typically thought of as a springtime phenomenon and that is when many people head to the woods to collect tasty mushrooms such as the famous morel. However, fall is an equally good time to admire mushrooms. Collecting and eating wild mushrooms is not a hobby for the careless or reckless. In fact, mushroom hunters readily admit that there are old mushroom hunters and there are bold mushroom hunters. However, there are no old bold mushroom hunters. That is because, while many mushrooms are culinary delicacies, others will kill you or make you wish you were dead. They may even taste terrific while at the same time destroying your liver or kidneys. Some mushrooms are easily recognized, bless them, but others require an expert and the price for mistaken identity is severe. 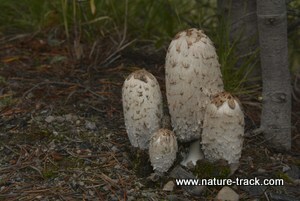 The tasty shaggymane mushroom is referred to as a 55 mph mushroom because it is so easy to identify, even from a car. Several others, collectively called Destroying Angel Amanita because of their potent toxicity, resemble the button mushrooms we buy in the store. 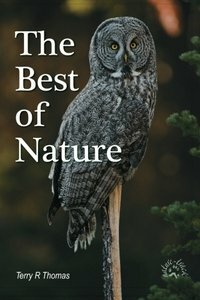 Experienced mushroom hunters recommend that novices learn the trade not solely from field guides but from other experts. Mushrooms are fascinating to observe and photograph. However, I hope I don’t disappoint you with my cowardice, but I won’t be collecting any for the table. I decided long ago that dying foolishly was really high on my list of ways not to leave this world. Death from eating a poison mushroom meets that definition.